Johnny Depp and Armie Hammer star in a scene from the movie "The Lone Ranger." NEW YORK (CNS) — The golden-age radio program that first had America asking, “Who was that masked man?” was a favorite with youngsters, as too was the popular television series it later spawned. So parents may assume, going in, that “The Lone Ranger” (Disney) — a big-screen attempt to provide an answer to that now 80-year-old question — is a family-friendly project geared to kids. Alas, for a variety of reasons, especially the film’s treatment of religion, such an assumption would be dead wrong. 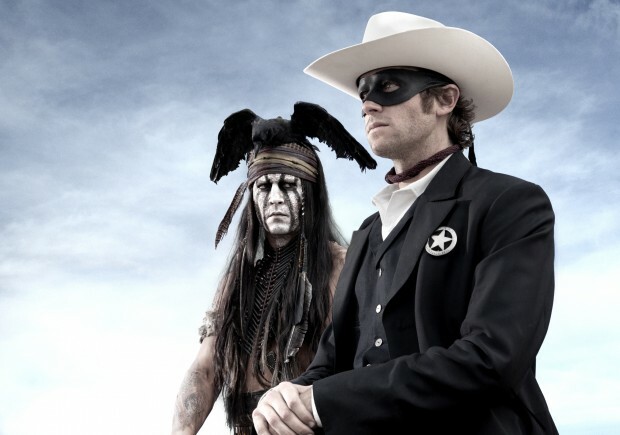 This eccentric and overlong reinterpretation of the familiar story centers not on the crime-fighting frontier hero (Armie Hammer) of the title, but on his faithful Native American companion, Tonto (Johnny Depp). When we first encounter Depp’s whimsical Tonto, he’s an elderly man living, inexplicably, within a 1930s diorama of the Wild West. Viewers are invited to feel their first enjoyable shiver of revisionist superiority as they observe that the display case holding Tonto labels him “The Noble Savage.” Oh, those insensitive Depression-era lug heads! The chance visit of a boy in a Lone Ranger outfit provokes a stream of reminiscences from Tonto, during which he recounts the circumstances that initially brought him together with lawyer-turned-lawman John Reid, his future “Ke-mo sah-bee.” He also recalls their struggle to capture Butch Cavendish (William Fichtner), a viciously depraved outlaw, one of whose crimes was to have a life-altering impact on Reid. Set primarily amid the race to complete the transcontinental railroad — with Tom Wilkinson playing train company executive Latham Cole, the shady driving force behind that effort — director Gore Verbinski’s action comedy offers a warning about the corrupting influence of greed. It also portrays, at least in accurate outline, the victimization of native peoples that resulted from the headlong pursuit of wealth and industrial expansion. But one of the aspects of European culture that gets trounced is Christianity, with believers shown up as either weaklings or hypocrites. Later, a cavalry officer who is responsible for massacring Indians repeatedly invokes God while ordering his troops into battle. And Cole, whose villainy becomes increasingly obvious, offers a smarmy grace that shows he uses God to his own purposes. By contrast, and in keeping with Hollywood’s current norms, Native American spirituality and values are generally glorified. Add to these factors Cavendish’s taste for human flesh, the played-for-laughs proclivity on the part of one of his accomplices for wearing women’s clothes and a series of scenes set in a brothel, and the resulting mix does not recommend itself for youthful — or even casual adult — consumption. The film contains a negative treatment of Christian faith, considerable action violence with some gore, mature themes, including cannibalism and prostitution, a transvestite character, brief scatological imagery and humor and at least one crass term. The Catholic News Service classification is L — limited adult audience, films whose problematic content many adults would find troubling. The Motion Picture Association of America rating is PG-13 — parents strongly cautioned. Some material may be inappropriate for children under 13. George W. Trendell, who created the Lone Ranger for radio in the 1930’s, must be spinning in his grave.